PHUKET: Official Songkran Thai New Year celebrations at three of the island’s main areas for festivities this weekend will have little or no water provided by local councils in their bids to conserve water as the long dry spell this year continues and the island’s three main reservoirs hit record lows. Patong Municipality will be providing water only at Bangla Rd, while in Phuket Town no water will be provided for the huge water fights held at Saphan Hin. Revellers will have to bring their own water, Phuket Town Mayor Somjai Suwansupana said plainly this week. Rawai Municipality, which also includes the Nai Harn area, has yet to figure out if they have enough water to provide for water play, Rawai Mayor Aroon Solos told The Phuket News. “If we do, it will be limited,” Mayor Aroon said. She also urged people to be wary of how much water they use during the festivities. “Please save water. Use small water pistols and please do not use kan containers for splashing people, that wastes too much water,” she said. Mayor Chalermluck said that she had faith that people will try to use water more sparingly than in previous years. “The water pressure has been reduced so much there is a lot less water supplied to the Patong area that people in Patong know well what they have to do. They will use their common sense and converse water, and if they want to play outside the Bangla water-play zone, they must provide the water themselves,” she said. In Phuket Town, lack of rain has seen water supply reserves fall to 20% capacity, noted Phuket City Mayor Somjai Suwansupana. “This year we will not be providing water outside of Saphan Hin, like we have done in years past,” she said. 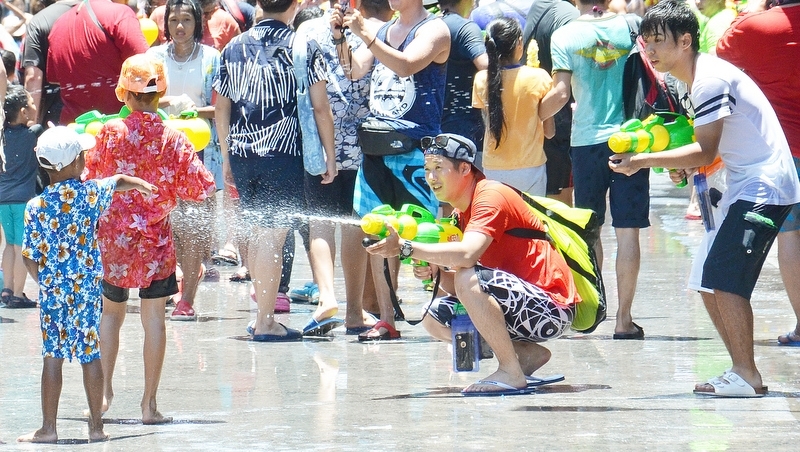 Even at Saphan Hin, the traditional focal point for water play for a huge number of Phuket Town residents, the municipality will have just one water truck available on Saturday (Apr 13), and that one water truck will deliver only two loads of water for people to play with, Mayor Somjai explained. “We limited the space for water playing at Sapan Hin, and the water festival event will be from 7am to 1pm only,” she added. “We strongly encourage that water be sprinkled on people, not splashed,” she said. Mayor Somjai was simple in her advice for people wanting to revel in water fights. “Please bring your own water, especially if you want to play outside Saphan Hin this year,” she said. Mayor Somjai repeated her call for all people to conserve as much water as they can until the annual rains return to replenish the reservoirs. As the world undergoes a climate change it strikes Thailand too. Next year water levels can become even lower. It is now time for committee's & sub-committees to start their meetings and after talks come into actions to prevent next year a possible greater water drought disaster. So far, no reservoirs & ponds dredging. Guess it is complicated 'budget-wise'( such works don't bring in money, not interesting for Officials) Are the public parks, golf courses and car wash stations now ordered to reduce water consumption to just a few hours at day- or night time? Imagine how much more water would be available in future years, if they would take the opportunity to dredge the reservoirs and ponds now. Easier to complain about than resolve the problem, I guess.